What is the Great Lakes Retreat? It is a full week of fun and exploration starting on Sunday afternoon thru Friday morning. Lectures are held everyday - both morning and night. Progressive in-depth Workshops are held both morning and afternoon giving you the opportunity to study two different subjects. Or during the same time period you have the option of attending Single Sessions, which offer a sampling of different subjects. 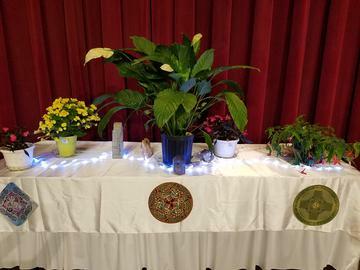 Nights are fun-filled, too, with Message Circles, Psychic Sampler, Variety Show, Live Auction, Healing Service, Drumming Circle, and gathering & sharing in the Zodiac Zone (hospitality room). 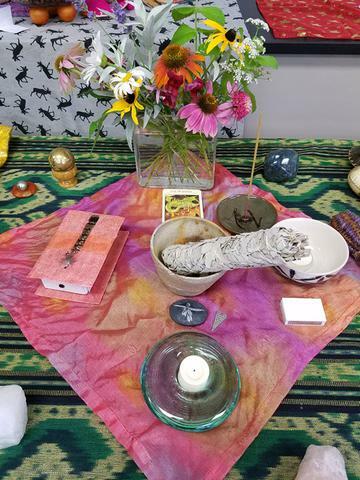 Other offerings include The Enlightenment Emporium (Gift Center/Book Store), Healing Center, Private Consultations with our counselors, Singing, and Swimming. All meals, lodging and programming fees are included in the regular tuition rate of $625. Check out our retreat brochure for this years theme: Questing for The Divine Heart Within and learn more about our presenters, workshops and 2019 events. IThe Great Lakes Retreat was originally part of Spiritual Frontiers Fellowship, which during the 1970s and 1980s had several retreats that met in different parts of the country. SFF was founded by Arthur Ford, the well-known psychic, minister and spiritualist medium, along with several ministers in 1956, to discuss some of the paranormal and psychic experiences they, and other church members were having, that couldn't be explained by the teachings of traditional Christianity. They had come to share Ford's opinion that much of the spiritual dryness so evident in many mainstream Christian churches could be attributed to a lack of direct experience of the spiritual world. Their mission was to be "an interfaith, non-profit movement" of religious leaders, writers, and business and professional persons who felt a kinship with and had a concern for the growing Western interest in altered states of consciousness and mystical experiences. The principles, purposes, and programs of SFF called for an emphasis on mystical prayer, spiritual healing, and the search for evidence of personal survival of death. SFF started with meetings in people’s homes, with conversations about their own experiences. As interest in these subjects continued to grow, they began to invite people to share their experiences with the group and at some point had to move the gatherings to larger locations. Eventually Chapters were set up in different cities, with Chairs or Co-Chairs to organize gatherings and events. Each summer retreats were held in different areas of the country, where members from the different chapters could gather for a week together and experience lectures, workshops, healings and a variety of different events. Through the years the SFF organization underwent several changes. In the early 1970s the original interest in mediumship and survival beyond death, gave way to a primary interest in meditation and spiritual healing. During this time SFF experienced a period of rapid growth. The organization experienced a major overturn in leadership in 1974-75 and a period of organizational chaos. When it stabilized in the early 1980s, the focus of SFF had changed. It had taken a new direction, identifying largely with the emerging New Age movement. In 1990 the name was changed to Spiritual Frontiers Fellowship International (SFFI). The first Spiritual Frontiers Fellowship: Great Lakes Retreat was held at Olivet College in 1978. In 1979 the retreat was moved to Albion College where it remained for the 1980, 1981, 1982 and 1983 retreats. In 1984 the retreat returned to Olivet College where it has remained for the last 34 years, with the exception of 1991 when it was held at Aquinas College, in Grand Rapids. Because of the many changes that took place over the years, and because we were one of the few remaining retreats ... in 1996 we voted to separate from SFFI and become our own retreat and non-profit organization. The Great Lakes Retreat you see and experience today is the result of a tremendous amount of work and devotion by many talented, creative and deeply committed individuals who have worked together tirelessly over the last 22 years … with a profound abundance of Divine Help and Guidance!